In your childhood, you may recall playing with a Spirograph. That’s a popular toy comprising a set of interlocking geared shapes that can be variously situated on paper to trace elaborate geometric patterns. Nature is a master at creating geometric patterns — from the whorls of a nautilus to the petals of a dahlia. Nature is no less masterful in space — one can find a superb example 800 million miles or 1.2 billion kilometers away, at the north pole of Saturn. There, we find a surprising hexagonal pattern whirling in the Saturnian atmosphere. Saturn’s hexagon is a persistent vortex system, not unlike a terrestrial hurricane but far grander. Measuring about 17,000 miles or 27,600 km wide, the hexagon is more than twice Earth’s diameter. It consists of a powerful zonal jet stream bounding a complex array of numerous storms around the pole. The jet stream flows in a hexagonal current, punctuated by a storm at each “corner”. While the individual components have differing rotational motions, the whole system rotates with the planet, once in nearly eleven hours. Discovered by the Voyager probes in the 1980s, the system has gradually changed color from a delicate robin’s-egg blue to a stout goldenrod hue. How can a storm system have corners? It has to do with fluid dynamics. In 2010, University of Oxford physicists Ana Aguiar and Peter Read devised a clever experiment involving concentric rotating cylinders in dyed fluid, based on previous work at University of Washington and University of Colorado. By adjusting the cylinders’ speeds differentially, they could induce eddies and zonal currents that stabilized in identical manner as Saturn’s hexagon. They could also produce other stable patterns - triangles, pentagons, even octagons! Aguiar and Read found that the physical parameters specific to a hexagon are fairly narrow, and therefore uncommon in nature. Hence, Saturn’s hexagon is unique in the Solar System. Even Saturn’s south pole (which also has a polar vortex system) does not sport one. Saturn is high and bright in the summer evening sky, near the constellation Sagittarius. 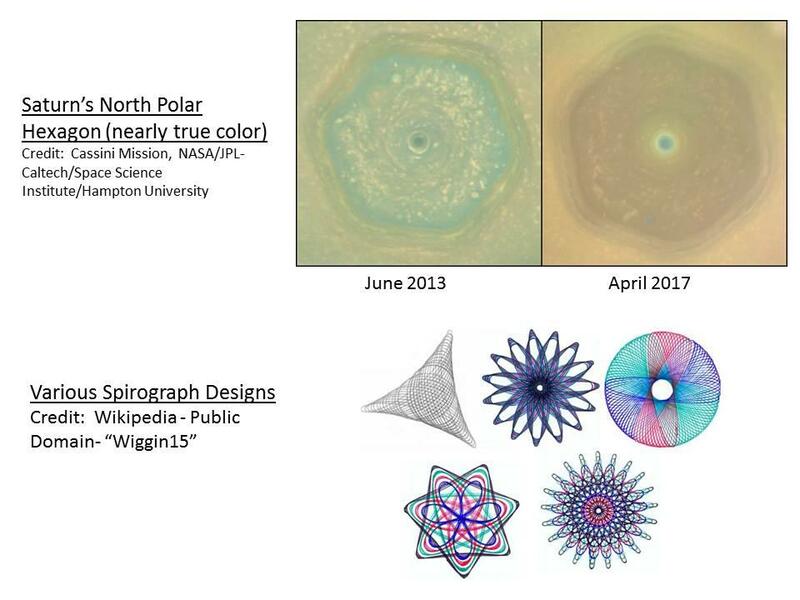 Take a moment sometime to spot it, and remember not only its beautiful ring system, but also its distinctive polar geometry. You’ve been listening to Western Slopes Skies, produced by the Black Canyon Astronomical Society. This feature was written by Michael T. Williams and voiced by Art Trevena.